Lester Little’s Religious Poverty and the Profit Economy in Medieval Europe. I started out researching women’s religious movements such as the Humiliati in northern Italy. 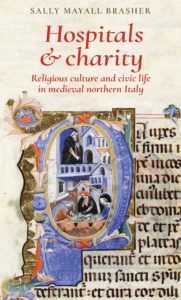 Their involvement in managing hospitals lead me to discover the overall importance of the hospital in medieval civic life. The medieval city fascinates me for its innovative governing mechanisms and responses to societal challenges. Researching in Italy is a great pleasure. Each small town has its own archive so it required a good deal of travel and allowed me to meet many interesting archivists and eat some amazing meals! The documents I used were mainly in medieval Latin and Italian. Even most of the secondary sources were in Italian. Translating so many documents was a great challenge. I published one other book, Women of the Humiliati, a Moral Response to Medieval Civic Life. MUP’s reputation in the field of Medieval History is outstanding. I have two projects in the works. I am expanding an essay on the political agency of Saint Catherine of Siena and a book on the historical foundations of certain modern issues dealing with gender and culture. Hospitals and charity is available now! Category: Author Q&A, Blog, History, Medicine	0 Comments.